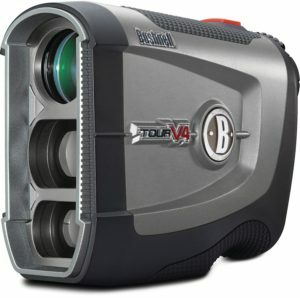 If you’re in the market for a serious purchase and are prepared to spend appropriately on it, you should look no further than the Bushnell Tour V4 Jolt, easily the best rangefinder in its class right now. The model is packed with several advanced features you won’t find in another model in its price class, and even in some higher-priced ones. Bushnell have really delivered a solid challenger to the market with this release, and the huge attention the device is enjoying is well-deserved. Measurements are accurate in a range from 5 to 1000 yards, and the device provides additional specialized measuring technology that further improves the accuracy of its output. This works by sending additional short bursts on top of the main laser, reinforcing the measurements and ensuring that you get a distance as precise as possible. On the other hand, you can also see your target more clearly with the built-in 5x optical zoom, and the device’s lens will additionally clean up the picture and ensure that you can focus on what matters most. You’ll get a nice overview of your target and you can easily use the rangefinder for some additional surveying as well, instead of having to rely on a second set of optics. Users have reported that using the buzzing feature of the device may result in a shortened battery life, but considering that the Bushnell Tour V4 tends to last quite a long time on a single charge in the first place, this shouldn’t be too bothersome to most users. The feature does offer quite a lot to those who get accustomed to it though, and the extra precision in knowing exactly when your target has been located can prove to be a huge benefit in some situations. The physical build of the device is great as well, with a sturdy body that can take a lot of abuse, while at the same time looking very stylish and modern. Bushnell have really gone out of their way to make this package an attractive one, and their efforts shine through every feature of this model.